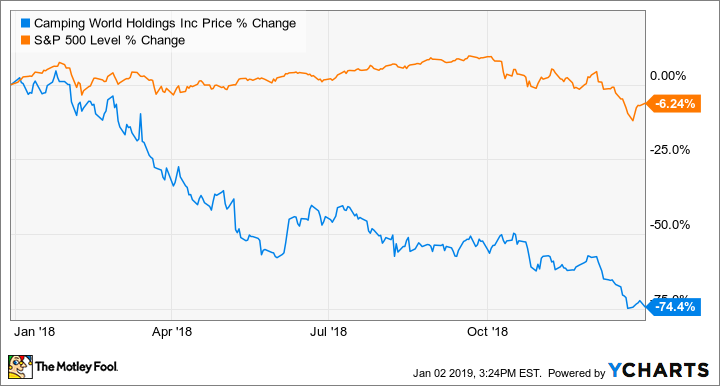 What's Driving Camping World Holdings 12% Higher Today? A new year brings a new look to Camping World's management team -- here are the details for investors. Shares of Camping World Holdings (NYSE:CWH), a leading outdoor and camping retailer with products that include recreational vehicles, camping gear, and services such as RV maintenance and repair, are up 12% as of 3:22 p.m. EST after the company announced a management shakeup. After all was said and done, 2018 turned out to be a rough year for shareholders, who witnessed the stock shed much of its value. Camping World decided to start the new year with a realignment and new assignments for the executive leadership team with the hope that it would foster a positive turnaround in performance and operations. Roger Nuttall resigned as president of the company's dealership group in late December 2018, and that position's responsibilities were divided between CEO Marcus Lemonis, and four tenured divisional RV presidents to make the decision-making process more efficient. Thomas Wolfe was also appointed to president of Good Sam, the company's comprehensive portfolio of recurring products and services, and Melvin Flanigan to chief financial officer. Our 2019 focus will be to better serve our customers, associates and shareholders while continuing to expand our RV market share with opportunistic RV acquisitions and completing the rollout of RV dealerships into newly opened retail locations. The hope is that these executive moves will enable the team to better focus on improving inventory management, reducing costs and expenses, and increasing margins and cash flow. Management also reiterated it will close underperforming locations, as it had already closed four unprofitable RV dealership locations and eight retail stores. While today's 12% pop might be a breath of fresh air for investors who have endured a rough past 12 months holding the stock, remember that it merely offsets the initial plunge when news came out that Roger Nuttall had resigned from his position. Executive management might have a new look, but it has many problems to turn around before long-term investors buy back in. Check out the latest Camping World Holdings earnings call transcript.